Today we decided to go for a lunch spot we never tried before, close to our house. As a tourist I would have difficulties to find restaurant Kagi. It’s not in Ishigaki city but in the North of the island and hidden between vegetation. Nothing looks like there is a restaurant here from the outside. And we love hidden treasures. Don’t you? 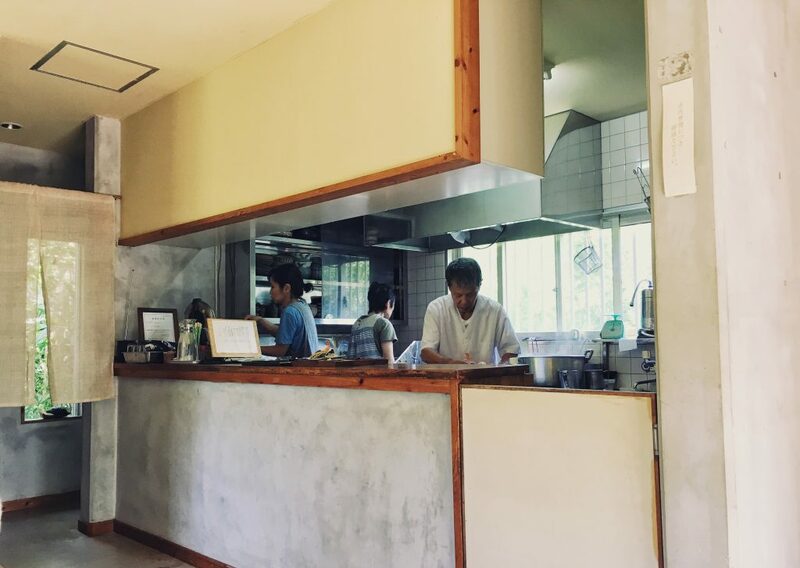 Kagi is a family restaurant, the father and chef is a Japanese craftsman. 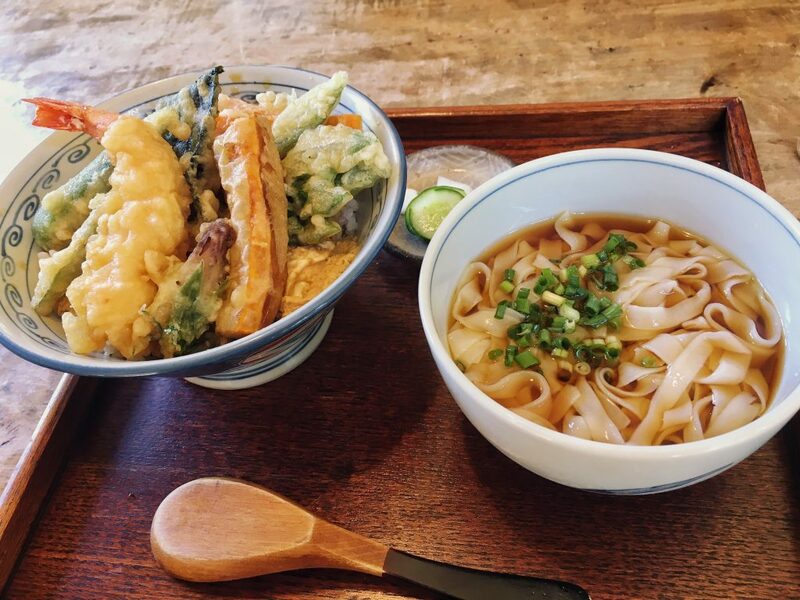 He makes the kishimen noodles himself by hand. Kishimen, a type of flat noodles, are a specialty dish and have their origin in the area around Nagoya, Aichi. 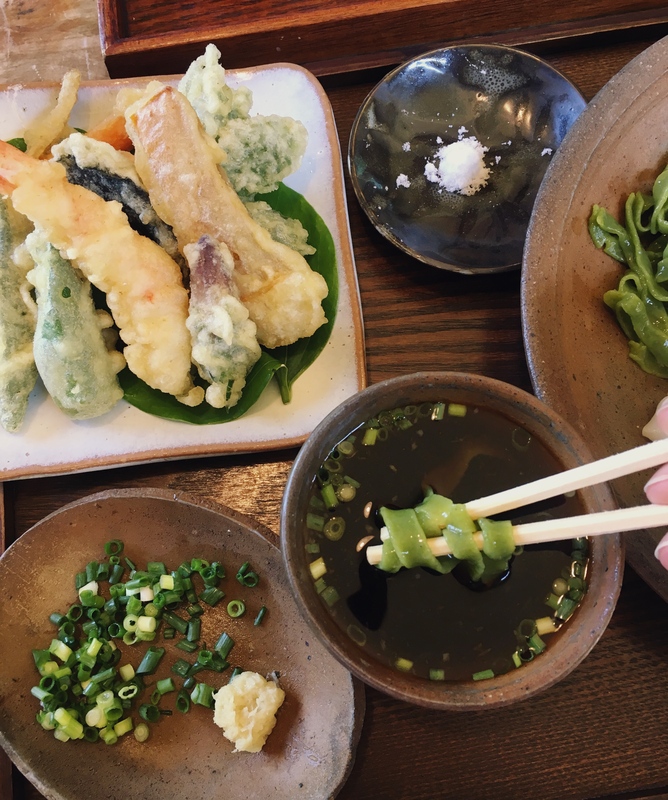 I chose a dish with three different kishimen flavours. The green chomeiso (the ‘long life leave’. 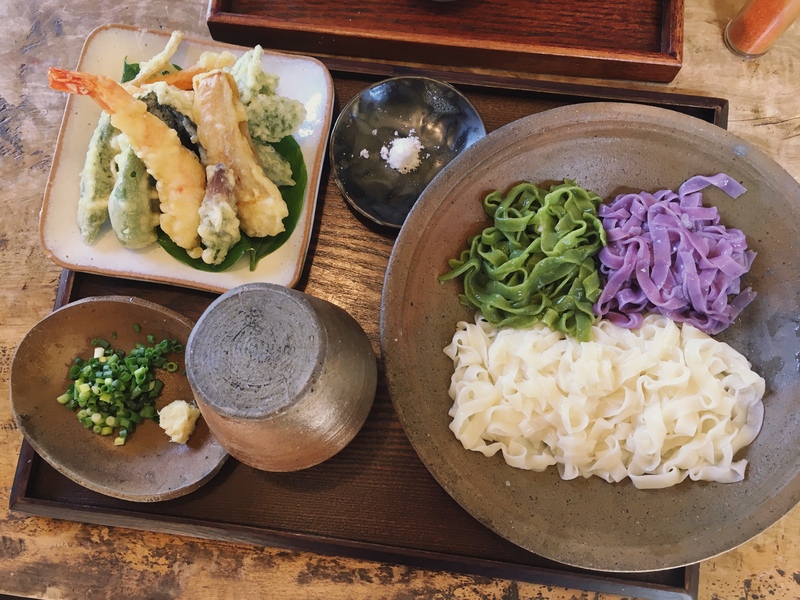 I wrote about them when we visited Yonaguni island), benimo (purple sweet potato) and the regular. Served with fresh fried tempura from pumpkin, chomei-so, carrot-onion, shrimp and okra. The sea salt on the small side dish is for dipping in the tempura. The colours and handmade pottery made me happy…the flavours even more. Crispy, fresh…yumm. The kishimen are dipped in the dashi soup, adding spring onions and ginger to taste. 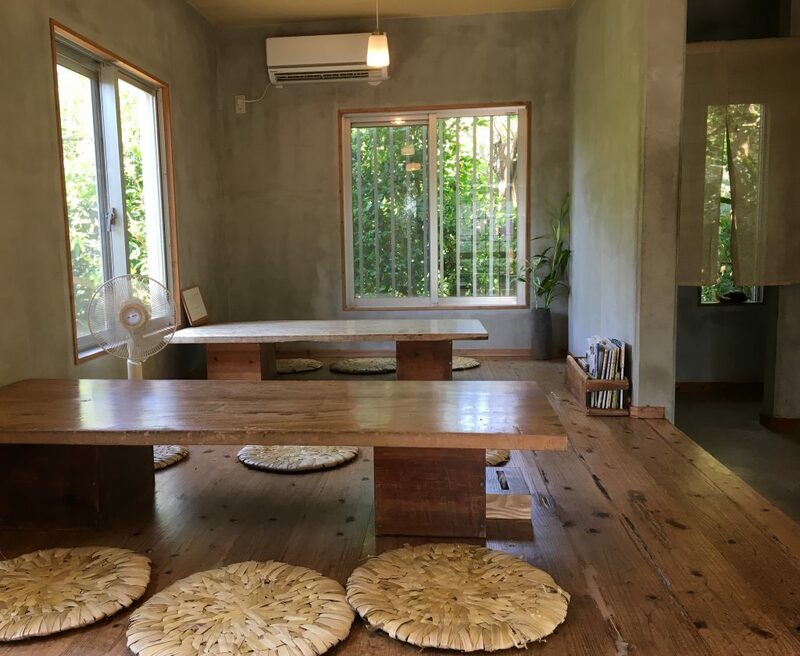 The interior is sparsely decorated with concrete walls and wooden tables. It looks trendy in some way. 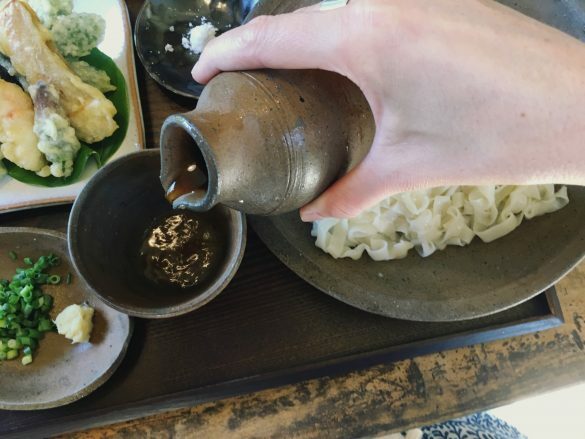 We also ordered a ‘rice bowl’, which is rice with tempura and a bowl of noodles in dashi. Every plate is fresh and homemade. 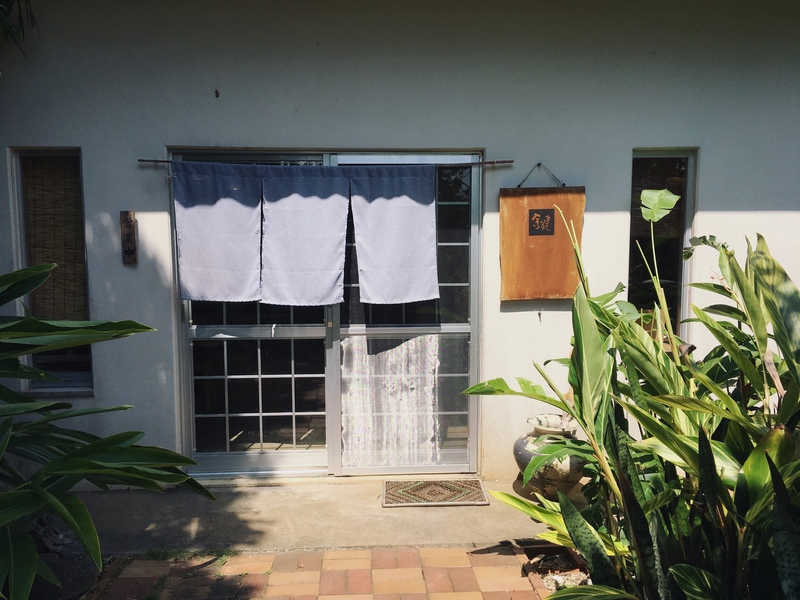 A little bit of main island Japan in Ishigaki.